WHO ARE THE DARK X-MEN? He has his own Avengers team and now Norman Osborn has his own X-Men team. The other shoe has finally dropped and Emma Frost has betrayed Cyclops and the rest of the X-Men. And that's just one of the huge surprises in "UTOPIA". Is that Namor? Cloak and Dagger? Professor X?! The thing that you aren't ready for is that Osborn is right. Collects Uncanny X-Men #513-514, Dark Avengers #7-8, Dark Avengers/Uncanny X-Men: Utopia, and Utopia Exodus. Well, the X-Men's stay in San Francisco is short lived. The Humanity Now! Organization's march through San Francisco in support of their bill to regulate mutant breeding brings about riots on both sides of the struggle. 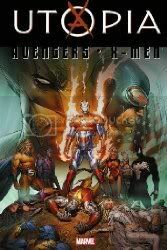 When the situation seems to be escalating out of control, Norman Osborn and his Dark Avengers descend on the city to bring order back to the city. And on top of that, Emma's secrets finally come to the front as she reveals that she has teamed with Osborn as leader of his newly formed team of Dark X-Men. Cyclops finally has decided that he's had enough and sets in motion his secret, which is the raising of the original Asteroid M, which he claims will be a mutant Utopia. He has decided that mutants need to be removed from the general human populace and so has set up Utopia as a sanctuary for all mutants and their families. I think this story hearkens back to the X-Men stories of the 80s and early 90s, when mutants were treated as second rate citizens and there was prejudice around the entire Marvel universe toward them. This is one of the aspects of the X-Men stories that has always intrigued me, how the mutants are treated by the government and general populace, and is a mirror sometimes to how minorities (such as gays) are treated in real life. Those were some of my favorite stories from back in the day; the X-Men struggling to be accepted by a world they are trying to protect. It seems like we may be seeing a more prevalent return to some of those themes in the current stories. Overall, a recommended read for X-Men fans.